Thanks to the popularity of the GH4 and to Suggestionofmotion.com for this creative blog. 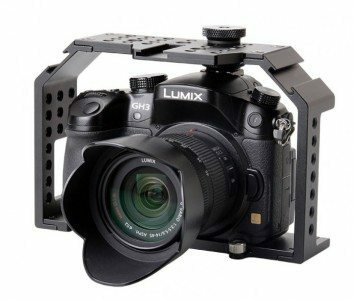 This post breaks down the pros and cons of the top 5 cages for the Panasonic GH4 and added to that is the FIRST 3D PRINTED cage for the GH4 in the marketplace! Affordable — The most affordable cage in this list. Simple & Straightforward — No flash, just pure functionality. Anti-twist — braces the front of GH4 to keep the camera from twisting. Ample mounting points – threaded and non-threaded 1/4″-20 and 3/8″-16 holes on top, left, and right sides of cage. 3 Built-in cold shoe dovetails — Allows quick-release mounting of accessories using an industry-standard cold shoe mount. Lightweight — Aluminum construction does not add a lot of weight to a camera rig. Mounting holes on top of cage do not maintain standardized spacing across entire surface — Mounting holes are split into two sections on top of the cage. Bottom line: A straightforward and affordable cage with ample mounting points for accessories. Minimal — Does not block the GH4’s grip, allowing you to hold and operate the GH4 like a normal camera. Industry-standard mounting points on top and left side. Height Adjustable — Standard 15mm rod used to set cage height so that cage can be used with larger cameras simply by changing rod length. Expandable — Standard ARRI dovetail base allows cage to quickly mount to 15mm rods, larger rigs, etc. Expensive — The most expensive cage in this list. Limited mounting points — Only has mounting points on top and left sides. Anti-twist block in the rear must be removed to use the GH4’s articulating LCD. Does not protect right side of GH4. Bottom line: A minimal cage that can stay on your camera and quickly mounts to other components to build up the rig as needed. Minimal — Does not block the GH4’s grip, allowing you to hold the camera normally. Smooth contoured design — No sharp edges. NATO side rail — Quickly mount/unmount gear using NATO rail clamps. Expensive — The 2nd most expensive cage in this list. 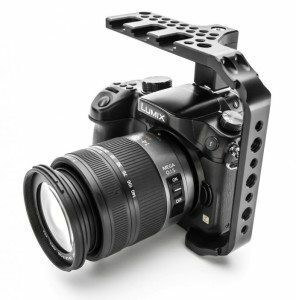 No anti-twist functionality — GH4 may be able to rotate in cage. Tall — Top of cage is higher to allow the GH4’s flash to be used, which results in a larger cage with dead space between the GH4 and the cage. Bottom line: A cage with versatile mounting options, but the lack of anti-twist functionality and HDMI clamping may pose an issue in some situations. For items 3 and 4, please go to the link at the bottom of this article. Mounting options. Customizable – More attachments can be added for any accesories you want to add in addtion to the 3 coldshoes already built into the system. Support. – top handle is also availabe – and because the cage is light weight, it can handle the weight of the camera. Add up to 2-3 top handles to the system! Built in HDMI guide. To keep your HDMI cable in place. Uni body construction. 3D printing means that the body of the housing and the handles are one solid piece. Easy access on all the controls. We’ve tested it! You can easily mount to any tripod or rail attachment. Price. It’s cheaper than anybody elses. In fact, you can order two and not spend as much as one of the competition units. Material. It is plastic. If you drop it, it may be damaged. But then again, if you drop your camera, it’s going to be damaged no matter what case it’s in! Check it out today at Shapeways.com. Special thanks and credits to SuggestionOfMotion.com.